Frank Vincent Zappa known as weird and different. He was an American musician, songwriter, composer, record producer, filmmaker, and actor. With a career that would span over 30 years just imagine all the great stories. 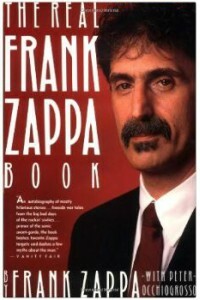 This is an autobiography said in the words of the rock music legend of Frank Zappa. Inside you will find funny stories of his weird lifestyle and rock n roll road stories and so much more. You will also get some black and white images to accent the stories aswell as some line art pictures. It is a paperback book that stands 8.9 inches tall and is perfect for all music fans to have on their bookshelf.